His wife Bernie McGuinness said that “our hearts are broken” following his death earlier this week. THE FAMILY OF Martin McGuinness have issued a statement to express their gratitude to all those who’ve sent messages of condolences and support after the political leader died earlier this week. His wife Bernie said that despite Martin frequently being away due to his political activism, he was “a proud family man who took great delight in the accomplishments of our children and grandchildren”. The former Deputy First Minister of Northern Ireland died on Tuesday. He’d been diagnosed with a genetic heart condition several months before. Tributes poured in for McGuinness from across political spectrums, with former President Bill Clinton among the mourners at his funeral in his birthplace of Derry on Thursday. Sinn Féin released a statement on behalf of Bernie McGuinness today where she expressed the family’s gratitude at the support they’ve received in recent days. She said: “On my own behalf and Martin’s family, I want to thank all of those who have offered their condolences since Martin’s death, including the countless people who sent messages, mass cards and prayers. I also want to express our deep appreciation of the many thousands of people who attended vigils in the course of the week in many parts of Ireland and overseas. 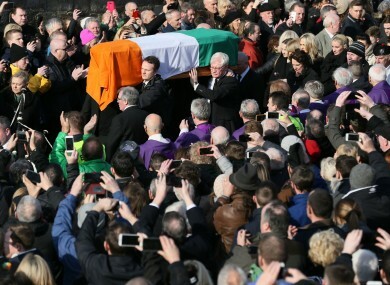 The doctors and nurses who looked after him during his illness were acknowledged, as were the many thousands who lined the streets of Derry for the funeral on Thursday. Words cannot express our appreciation at the outpouring of love and solidarity, which embraced us throughout Thursday. McGuinness’s widow added that both she and her entire family had been touched by the efforts of so many to “provide solace and comfort throughout this very difficult period”. Despite being a “republican activist for all of his adult life”, which frequently took him away from his home and family, he was “a proud family man who took great delight in the accomplishments of our children and grandchildren”, she said. He loved his family. And we love him. Our hearts are broken. Email “'Words cannot express our appreciation': Family of Martin McGuinness touched by support”. Feedback on “'Words cannot express our appreciation': Family of Martin McGuinness touched by support”.